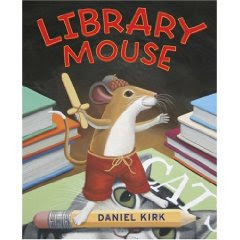 Last week the librarian at the school where I volunteer read this book, Library Mouse by Daniel Kirk, to the kids and I thought that Z would enjoy it too. The titular mouse, Sam, lives in a library and comes out at night to read all sorts of books. Eventually he tries his own paw at writing and makes a small book, Squeak! A Mouse's Life. He tucks it away in the biography section and some kids find it the next day. Then he writes a second book, The Lonely Cheese, a picture book this time. Finally he writes a mystery that the kids love. They leave a note asking the mysterious Sam to come to their "Meet the Author Day". Being a mouse, he can't attend but sets up a little surprise for them. He sets up a mirror under a sign that says "Meet the Author" and in this way gets each of the kids to write their own books to add to the shelves. This is a pretty text heavy picture book so for younger ones (like Z), it's probably a good one to read ahead and paraphrase. The illustrations are bright and happy and Z loved the idea of little mouse-sized books. The sequel to this book, Library Mouse: A Friend's Tale, comes out on March 1. Buy Library Mouse on Amazon or find it at your local library. Oh, this sounds absolutely delightful.